Markarian 739 is thought to be 425 million light-years away. Its two bright "nuclei" are clearly seen in this Sloan Digital Sky Survey image. A remote galaxy is said to host two black holes. Could an electrical explanation better fit the observation? Electric Universe advocates propose that electric currents in plasma generate magnetic fields that constrict the current. As previous Picture of the Day articles point out, the constricted channel is known as a “Bennett pinch,” or “z-pinch.” The pinched electric filaments remain coherent over long distances, spiraling around each other, and forming helical structures that can transmit power through space. Those strands of electric current and spiraling formations are seen in almost every body in the Universe. Venus possesses a comet-like tail that is “stringy,” as NASA scientists describe it. Twin vortices of electric current are also visible at Venus’ south pole - counterparts to the those discovered at Venus’ north pole. Comets, themselves, are often observed with twin tails, kinked tails, “wiggly” tails, or multiple tails. Comets manifestly demonstrate the electrical nature of charged celestial objects. Planetary nebulae are threaded through with strings and webs. Glowing, braided filaments are sometimes visible in “jets” that blast out from stars and some galaxies. The filaments are called “Birkeland currents,” and they are the visible portion of enormous electric circuits that form that large-scale structure of the Universe. The circuits generate magnetic fields that can be mapped, so their helical shape can be seen. Plasma’s behavior is driven by conditions in those circuits. Fluctuations in charge flow form double layers with enormous voltages between them. This means that electric forces in double layers can be several orders of magnitude stronger than gravity. Double layers separate plasma into cells and filaments that can have different temperatures or densities. Various components coupled to and driven by electric circuits in space comprise the heart of Electric Universe theory. Charged particles accelerating through powerful electric fields radiate energy in many bandwidths. Changing conditions within Birkeland currents can alter the radiation patterns in some galaxies over time. 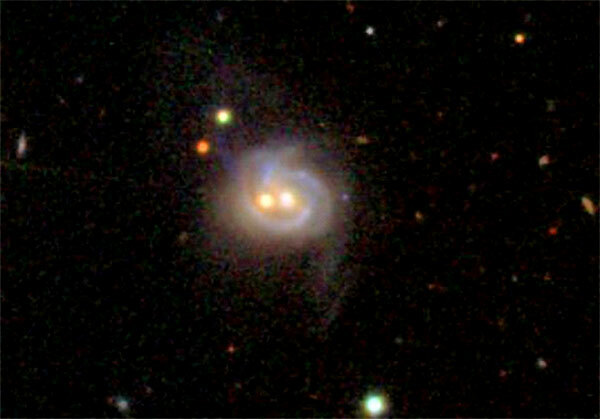 According to a recent press release, a “colliding” pair of galaxies is creating a double-eye formation in Markarian 739. Since it is a foundational assumption of modern astrophysics that over 90% of galaxies harbor Supermassive Black Holes (SMBH) with gravity exceeding 100 million stellar masses, the conclusion is logical from a conventional viewpoint. However, the Electric Universe position in these cases is that the image is a view “down the barrel” of a Birkeland current filament pair spiraling down and concentrating electrical energy. The Bennett pinch regions are seen end-on, where electricity flowing into them causes plasma to erupt in a burst of radiation.